Free. Separate admission charges apply to the collections. As a former royal property, Somerset House has a long history of monarchs who have lived here. However, it fell into a state of disrepair and the royal residency was set up at Buckingham Palace. The house was refurbished by Sir Christopher Wren in 1685 but was not used for royal housing. It was, instead, used to accommodate royal guests when they visited London. Nowadays, Somerset house is used as a centre for the visual arts. 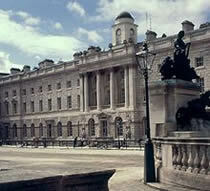 Inside it is the Courtauld Gallery, the Hermitage Rooms and the Gilbert Collection. During the winter months the courtyard hosts the annual ice rink, but in other seasons it has a display of fountains spurting from the ground to different heights.